There’s a saying my grandmother likes to use when people are eating dinner: instead of saying ‘I’m full’, she prefers ‘I’ve had an elegant sufficiency’. It’s this phrase which sprang to mind as I finished We See A Different Frontier: because everything about it, from the overarching themes of the stories themselves to their place and number in the collection, feels perfectly designed to amaze, impress and satisfy. It is, in every way that matters, an elegant sufficiency of stories; the kind of anthology that leaves you feeling eager – but not starving – for more of the same. 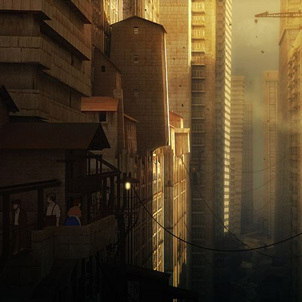 Bracketed by a preface from Aliette de Bodard and an afterword from Ekaterina Sedia, Frontier is a powerful, fascinating and deeply necessary examination of colonialism through an SFFnal lens – and, by extension, of its real-world history and legacy. In a genre which so often deals with questions of technology, expansion, power and revolution – spacefaring explorers discovering new worlds, rebels battling empires and dystopian states, humans negotiating with elves and aliens – the Western, imperial roots of much classic SFF also dictate that, even though there’s a glut of stories championing the underdog, exulting in their endless against-the-odds victories over a sea of evil masters, it’s comparatively rare for the oppressed heroes of science fiction to resemble those groups most oppressed in real life. All too often, we shy away from stories whose oppressor/oppressed dynamics purposefully and overtly reflect our many real-world inequalities. There are, for instance, any number of dystopian stories that lament the narratively-imposed lack of heteronormative romantic choice, but none I can think of that mimic the actual, real-world oppression of queer love. Similarly, and despite the awful volume of historical evidence that human colonialism and Western expansion have invariably been fraught with violence, evil and bigotry, our stories tend overwhelmingly to suggest the opposite, couching human colonists as either enlightened liberators or scientific progressives, and Western (or Western-style) hegemony as the system that supplants, rather than endorses, tyrannical empire, or which at the absolute best is shown to be open to abuse, not because of any inherent flaws, but due to the temporary lack of a Good King. All too often, we shy away from stories whose oppressor/oppressed dynamics purposefully and overtly reflect our many real-world inequalities: at best, we brush them off as didactic, simplistic and agenda-laden, their messages so obvious as to go without saying (because doing so makes us uncomfortable, natch), and at worst, as biased propaganda designed to make “us” look like the bad guys. Which is what makes Frontier such an important – and deliberate – departure from the norm. Its diverse group of authors have infused their narratives with their own real-world understanding of oppression, colonialism and privilege, creating a richer, more nuanced, and more fundamentally honest collection of SFFnal stories than I can ever remember seeing. First up is Shweta Narayan’s elegant and powerful The Arrangement of Their Parts – a subversive piece of Indian steampunk wherein an imperial Englishman’s dialogue with a clockwork peacock reveals the former’s bigoted, scientific cruelties and the latter’s intelligence. Structured against a brahmin fable, this is a beautiful, thought-provoking piece, and an excellent start to the anthology. Next up is Pancho Villa’s Flying Circus, by Ernest Hogan, a title perfectly chosen to contrast the philosophical absurdity of Monty Python with a retrofuturistic story extrapolated from Pancho Villa’s real, historical decision to give Hollywood proprietary rights to film his battles in the Mexican Revolution. Truth being stranger than fiction – and this fascinating historical detail not being much promulgated in classrooms – I wouldn’t be surprised if at least some readers assumed this story’s entire premise to be an invention of Hogan’s, but knowing that it isn’t makes both the comic and political dimensions of this story all the more satisfying. In an all-over strong anthology, Silvia Moreno-Garcia’s Them Ships is one of the strongest pieces; it went straight on my Hugo ballot as soon as I finished reading it. In an all-over strong anthology, Silvia Moreno-Garcia’s Them Ships is one of the strongest pieces; it went straight on my Hugo ballot as soon as I finished reading it. Written from the perspective of a formerly-oppressed woman who finds that the alien invasion of Earth has dramatically improved her lot in life, much to the disgust and confusion of her formerly-privileged roommate, Them Ships is the sort of thought-provoking, powerful story that stays with you for years. By contrast, J. Y. Yang’s Old Domes is memorable and emotive in a completely different way, intertwining a thoughtful examination of Singapore’s colonial history with one of the more engaging short fiction premises I’ve seen for a while. Here, old buildings develop anthropomorphised, essentially magical guardians who need to be destroyed by trained cullmasters when their locations are due to be demolished or refurbished, in order to make way for their successors – but what else do these culls destroy, when a building retains old memories that people have forgotten? Switching from the fantastic to the futuristic, Fabio Fernandes’s The Gambiarra Method is an intimate look at the consequences of time-travel in a multicultural future. Though the science details are both convincing and interesting, it’s the human element that really sells this story: the relationships between the characters, the pressures imposed by bureaucratic management, and the knowledge that the world is both bigger and more complex than we can easily understand. Dinesh Rao’s A Bridge of Words is a gorgeously story of language and history and aliens, one I adored even as it challenged both my assumptions and my privilege. As a reader with only a very general knowledge of Indian history and culture, I could identify its relevance to and influence on the story without being able to contextualise it further – by which I mean that, as a white Westerner, it was possible to read the story as being wholly science fictional, one that was set on a planet other than Earth and dealing with an imagined culture whose rhythms resembled things I found familiar, but without ringing any specific bells. Yet the more I thought about it, the more I realised that my own ignorance was clouding my analysis; that it was just as plausibly a story set in a future India with science fictional elements. Which made me wonder in turn whether the ambiguity – if it was ambiguity, and not just a consequence of my lesser knowledge – was itself deliberate: a way in which the story’s focus on the loss of origin and identity was subtly mimicked by making the reader uncertain whether events were rooted in fact or fiction. Either way, the story not only succeeded in engaging me, but in making me think further about the issues it raised, and the question of my own default settings. Dealing (also?) with a future India, Rahul Kanakia’s Droplet takes a very different approach, examining the experiences of first, second and third generation Indian-Americans in a water-scarce future. This is an emotionally and socially complex story, extrapolating family tensions as adeptly as it does generational and cultural ones, with racism and its politically-sanctioned microaggressions a constant background presence. Joyce Chng’s Lotus is concerned with a different future: not one of water-scarcity, but of sea levels that have risen so dramatically as to almost eradicate dry land, turning humanity into water-travelling nomads. Both gentle and political, this is the sort of story that enlightens through clarity, evoking compassion, not through outrage, but empathy and calm, without ever feeling saccharine. Given its midpoint occurrence within the anthology, this is also a particularly well-placed story, giving the reader time to pause and replenish themselves as the heroine does likewise. Next up is Lavie Tidhar’s excellent Dark Continents, which skilfully interweaves various real and possible histories of the English colonial incursions into Africa with parallel, science fictional ones, where alien races travelling through dimensional portals turn the would-be colonisers into the colonised. This is alternate slipstream history at its best, and left me grinning for quite some time afterwards. Sunny Moraine’s A Heap of Broken Images is, by contrast, wholly science fictional. Written from the point of view of a very convincing alien reflecting on the violence, both psychic and bodily, done to their species by aggressive human colonists, this is a pitch-perfect examination of the crucial relevance of different perspectives in parsing events, and how those perspectives are defined, not only by their originating cultures, but the ways those cultures can be altered by unanticipated tragedies. Fleet, by Sandra McDonald, is a futuristic, after-the-fall style offering with a fa’afafine narrator, something I’ve never seen in fiction before, but which works particularly well in a story that’s as much about the impact of outsider/insider identities as it is about isolationism and politics in a dystopian future. That being said, Fleet still gave me pause, not for being in any way poorly written or overtly disrespectful (or at least, not in ways that were immediately obvious to me, given my own cisgendered privilege), but for being the only story in the anthology written about a culture and personal experience that was profoundly and clearly not the author’s own. That doesn’t make it a bad story – it was, after all, selected for a reason – but given the cultural specificity of fa’afafine as a gender identity, it was something I felt worth noting. With N.A. Ratnayake’s Remembering Turinam, we return again to a wholly imagined setting – this one fantastical, rather than futuristic – and the pivotal consequences of the colonial erasure of language, particularly given the extent to which language both shapes and is shaped by thought. This is a touching story with a strong familial core, and an emphasis on the idea that rebellion isn’t just swords and fighting, but the viral defiance of words. Sofia Samatar’s I Stole the D.C.’s Eyeglass also deals with defiance, but of a different kind again: as a refusal of both the sexism of one’s own culture and the racism of the oppressor. This is a powerful intersectional narrative, weaving together forbidden magic, sisterhood and faith to make a profoundly satisfying whole, and one whose concluding sentence gave me shivers. Every time I read a new work by Benjanun Sriduangkaew, I feel like someone is jimmying open my brain and pouring in liquid brilliance. Her prose is both electric and poetic, supporting original, dazzling stories that never cease to impress, but which always defy both ready description and easy categorisation. Vector is no different, a powerfully political piece of feminist Thai cyberpunk that also went straight on my Hugo ballot. All I can say is: read it. Read it now. Returning to the theme of the British colonial empire, Gabriel Murray’s Forests of the Night – a title which, given the story’s focus on the presence of an impossible tiger in England, pays a neat homage to Blake’s The Tyger – is both haunting and profound. This is a story that isn’t what it appears to be, and which neatly dissects the questions of genetic inheritance and personal identity in the face of familial racism. See A Different Frontier is an impressive, polished collection of incredible stories. Finally, with What Really Happened in Ficandula, Rochita Lonen-Ruiz’s provocative, fantastic retelling of a real occurrence from the Western colonisation of the Philippines – a well-executed story that is equal parts harrowing and hopeful – the anthology draws to a close. We See A Different Frontier is an impressive, polished collection of incredible stories, and the only thing I can find to say that’s even remotely negative is that it’s deserving of a far more beautiful cover. (The existing image, alas, is more reminiscent of MS Paint than professional design.) But there’s a reason we exhort readers not to judge a book by its cover, and if there was a ever a volume destined to cement the vital importance of that sentiment, this is it. 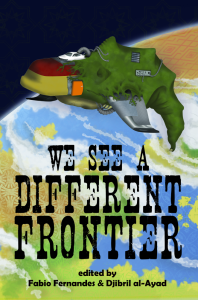 We See A Different Frontier is an anthology I’d have no hesitation in recommending to everyone and anyone, and which I hope is given the widespread respect and admiration it so manifestly deserves, not only within our current SFFnal community, but in the future. Wonderful review, Aidan. I need to get to this anthology at some point. Jared wrote really nice things about it over at Tor.com too, a while back.